Keep it up! Sounds like you have everything in control. As far as Lambeau yeah that sounds like my Cora. She is super loyal and stays close out in the field and at home. Like you said if only they could help on the fish responsibilities. Lol!!!! wow man that sapphire ruby is stunning...love the shape, especially the forehead up to the 1st dorsal ray...what a stunner!! I know I promised pictures over the weekend, but I've had a hectic week at work and I've been doing my best to get the fiance trained up to take care of the fishroom while I go to Chicago for a week. Some updates: I added a second HOB filter to the left side of the tank, an AQ70, packed with poly-fil and a sponge. I've been fighting off the bacterial bloom and the poly-fil/filter floss helps to clear up the water. I also added some filter floss to my AQ110, the water clarity is looking much much better, and I think were just about over the hump as far as cycling goes. These guys were being super picky with food the first week, I finally have them eating other things than FDBW. At first they would just "act" like they were eating beefheart or the Han's flake. Just about everyone recognized my bearded mug and begs for food when I come to the tank. The alpha dog in this group is the little albino, I can't put my arm in tank without him plucking my arm hairs out. He's the smallest of the group, but with his attitude and appetite..I wouldn't be surprised if he ends up being the biggest a year from now. It's been awhile since i've updated this thread, I know I promised better photos, but I'm still catching up from vacation. The group as a whole is doing great, however, 1 fish isn't doing well (the lone Ring Leopard). It hasn't ate since before I left town, white cloudy poop and cloudy eyes. When my fiance called me while I was out of town, I walked her thru setting up a hospital tank for the fish and have been treating him with Metro for about 4 days now....hopefully he pulls through, but I haven't noticed much improvement. Also, I have grown bored with my planted 55 gallon, once I got back into discus, the community tank just doesn't do it for me anymore. 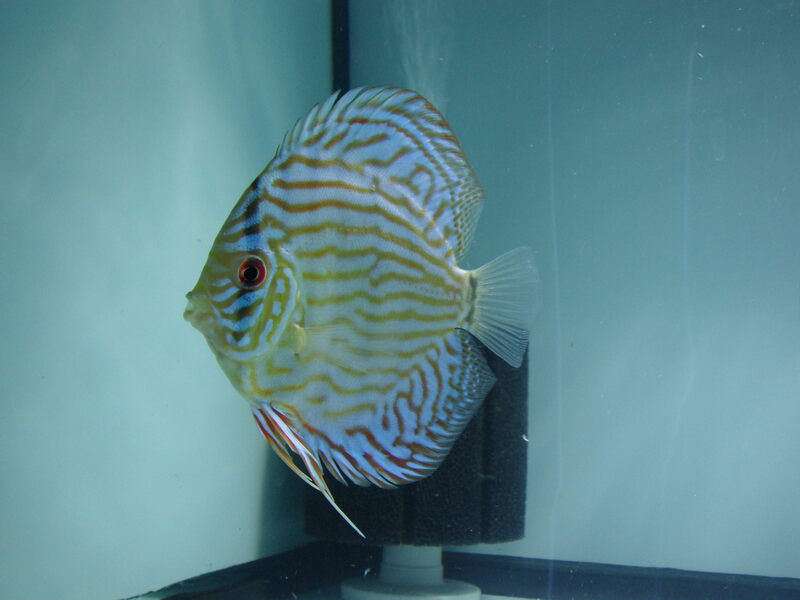 I have been considering breaking it down and trading in the livestock and plants for store credit, and possibly setting up another discus tank and shuffling some fish around....we'll see what the next few weeks brings. Anyway, I was able to snap a few photos during feeding time, the best colored fish was nice enough to sit still for me and get a good shot. The sapphire ruby thinks it's slick and tries to grab the cube from the cone....it never works out in her favor. It's been a few weeks since and update...and quite frankly, a lot has changed. I've since purchased a second 135g tank, repainted the original from black to white, added a couple new fish from Kenny's July shipment, reorganized the fishroom, and shuffled the discus around according to size so I don't have such an overstocked tank. The wall in the fishroom is just over 12ft long, so these 2 135g tanks take up the length of 1 of the walls. We tried some new paint on the newer tank and it didn't turn out so good, so we are going to strip that down and repaint it again so while that tank is under construction, I will have to move everyone over into 1 tank again for a couple days. 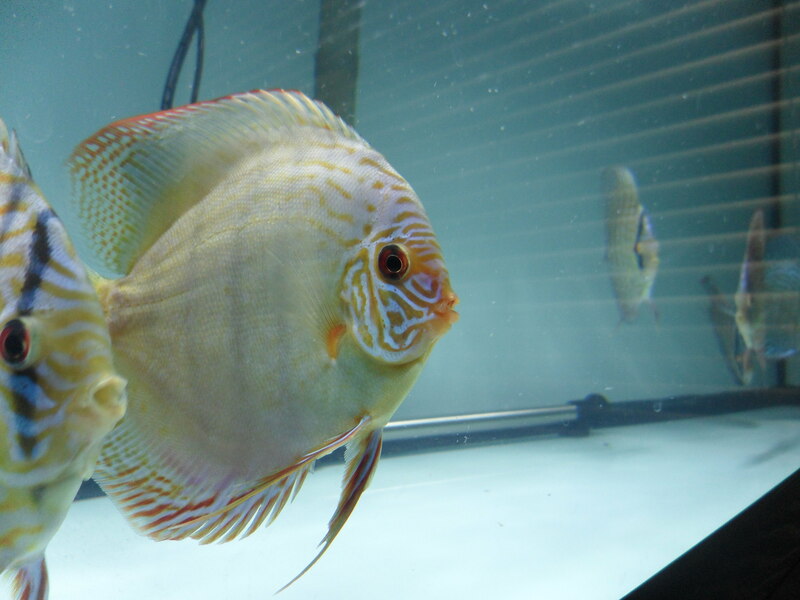 Once that gets completed, we're going to move the flowerhorn and planted tank back into the fishroom, get everything plumbed up..then I just need a recliner in there so I can sit around and enjoy them! Cheers! I love your Alenquer, and had been thinking about a Penang Eruption, now I may have to get 1 of each. Beautiful fish. Hope your leopard gets better, he is another beauty. Good luck with him. I was originally going to get a blue diamond, but Kenny said this batch of Alenquers were very good, I trusted his judgement and had him pick me a winner..super satisfied with this fish. I myself like to keep 1 strain in the same tank, but my better half likes to mix it up...as long as I let her do her thing and pick some variety fish she doesn't complain about all of the tanks and helps me with maintaining everything. She seems to be drawn to the spotted fish - Leopards, Eruptions, etc. Where as I'm more a fan of turq strains. Now I know where my 4th Alenquer went! LOL! 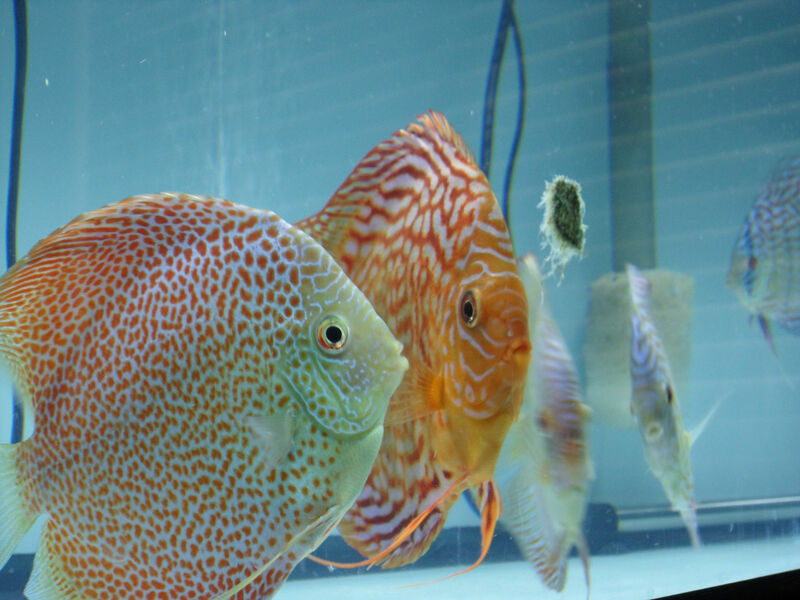 They are beautiful fish. I got three from Kenny and they are all doing well. I, too, liked the Eruptions from the photo but now that I have the Alenquers I would not exchange. I was able to finally get the better camera going, however, for some reason it would not let me upload them directly to the site. I know Al said specifically he wants them on the site so they stay there, but some of them were pretty darn good so I thought I'd share them anyway. Last edited by 0Dgreen; 08-03-2018 at 06:56 PM. Also, it is REALLY hard to get a decent shot of fish.....Props to all the legitimate photographers, those NADA pics that were posted must have taken a lot of time and patience! Again, I know the contest is over...just thought I'd toss up some updated photos. I have shuffled some of the fish around, and left the ones that grew best in this setup. There are 3 pairs forming up in here, I get eggs on the daily...there are at least 6 females in this tank and only 1 confirmed male, and 1 suspected male. 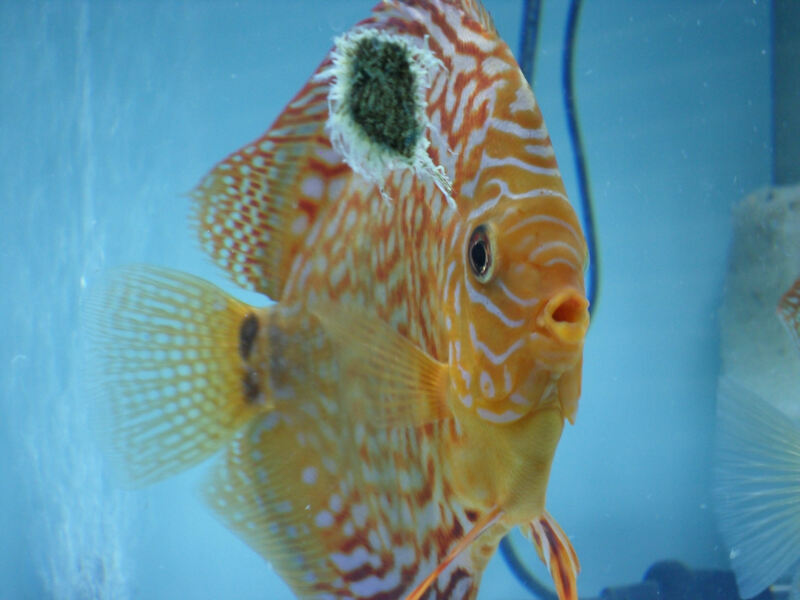 These 2 fish that are pecking the cone are my 1st confirmed pair, I've gotten 3 batches of wrigglers out of them...I just haven't buckled down and setup a breeding setup for them yet. These are my biggest 2 females, they are always trying to win over the biggest male in the tank, who happens to be to the right. 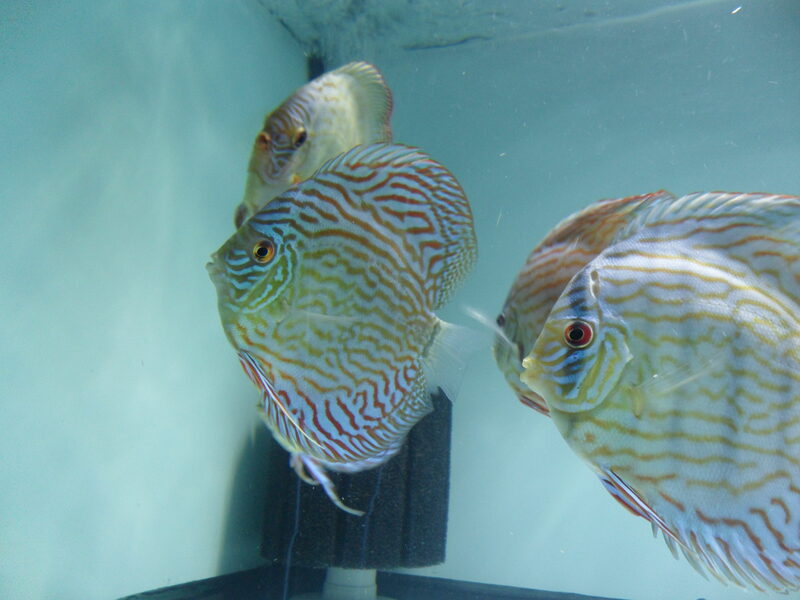 really nice group of discus there mate...the 2 big girls are stunning, some nice breeding stock for sure! Thank you both! I wish I could have gotten better shape/size out of some of them at this point...but, they are still young and growing...just a lot slower.